The bathroom is often the smallest room in the home, but it can pose a huge challenge for kids. Younger children often lack the height and coordination required to step into tubs or to reach sinks. Child-size fixtures, while they may seem to be the immediate solution, can pose a problem when it comes to selling a home. So rather than redo a small bathroom to suit the child, it is more practical to build with both adults’ and children’s needs in mind. Consider hiring a contractor for quality remodeling services to help you make your bathroom kid-friendly. Here are a few design options. A standard vanity. Kids will soon grow older and taller — so build a standard-height vanity, by all means, and instead keep a small stepstool tucked away for the use of smaller children. Kid-proof countertop. An ideal material for kid-friendly countertops is quartz. It is scratch- and stain-resistant and can mimic the look of granite without the issues. Standard-height toilet. Your best bet is a standard-sized toilet that little kids can reach easily with the help of a stepstool. For additional safety, consider a soft-closing toilet seat. Bathing options for all ages. An adjustable showerhead and handshower are ideal, as the showerhead can be repositioned as needed. A handheld sprayer is also handy for bathing little ones. Anti-scald. Scalding is one of the most common bathroom accidents that happen. That’s why it’s best to install anti-scald devices on faucets and showerheads. These control temperature by limiting the amount of hot water that can flow. Storage. Kids love bath toys. Dedicate a storage spot for each kid to keep their things and keep them off the floor so they don’t cause trips and falls. 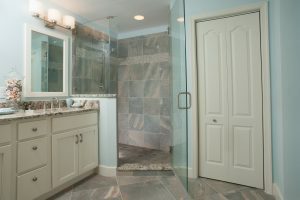 DreamMaker Bath & Kitchen’s remodeling professionals draw on decades of industry experience to take care of your every remodeling need. Interested in what our remodeling professionals can do for you? Check out our location to find your nearest DreamMaker Bath & Kitchen.